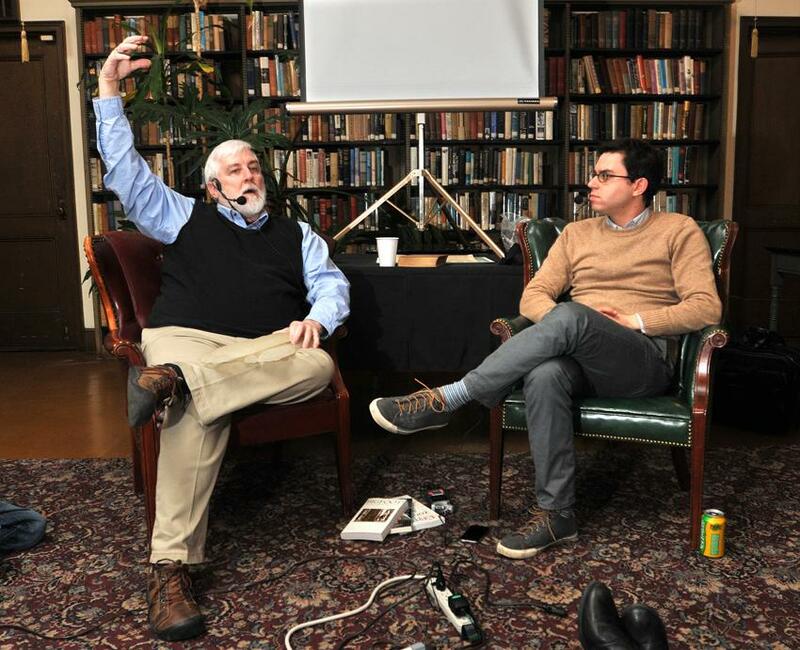 Loren Coleman, left, speaks with host Joshua Foer at the Institute Library in New Haven. In our previous post, "Cryptozoologist Loren Coleman Speaks about Melba Ketchum's Bigfoot DNA Study" we quoted the New Haven Register article interviewing Loren Coleman. Since our post we received comments regarding a few of Mr. Coleman's statements, in particular his "No data, no discovery" and "Angel DNA" comments. In discussing the recent DNA news, I quoted John Hawks, the Wisconsin anthropologist, in my agreeing with his notion that “no data, no discovery” is the stance to take. My attribution to Hawks was absence from the article. I said that quotes supposedly from the researcher in Texas, saying ridiculous things like “These are angels from heaven,” were released on Facebook, and that does not help the cause of serious research on Bigfoot. Those remarks were denied later as having been said by the Texas individual. The article does not make it clear I was talking about the leakage and not the exacting quotations. In the solving of the source of the “Montauk Monster,” at my New Haven talk, I was clear to credit myself and others for pointing to a “raccoon in second-stage decomposition,” as what the thing on the beach was. Besides myself and a New York game official, Darren Naish was behind the solution too. We wanted to cover the two primary topics that were discussed in our comments area, but Loren Coleman also touches upon other aspects of his New Haven interview, and your welcome to read them here. that was good, also articles and reporting are often EDITED! it's sometimes horrifying when you read an interview (in print or even video...) and you see what was edited out. OR you say "oh gosh I really was not clear" or "Opps I forgot to say this..." So thanks for the update and also the fun site! Thanks Guy for the update. I have a lot of respect for Loren. However I was appalled when I read the unclarifiyed version. Glad to see this,,thanks Guy! I'm a huge fan of Loren Coleman. He was one of the first Bigfooters to view my blog and leave a comment. My first Bigfoot book I read, besides the TIME/LIFE one, was Loren Coleman's book. I'd have to agree. Just the fact alone,that he's dedicated his life to the unknown and is not shy about it,and is extremely knowledgable on so many subjects,including BF,is outstanding.